This picture book uses brightly coloured pictures and simple, straightforward text to introduce children to the iconic American artist, Georgia O'Keefe. It gives the basics of Georgia's life and how she became an artist, though it is a little bland and simplistic. It would at least make children aware of her existence, and in the back, there are suggestions of other books for further reading about Georgia and her art. I was surprised that the art in this book doesn't seem to Imitate Georgia's style, or give any examples of it, which seems a bit of a glaring omission in a book about an artist. 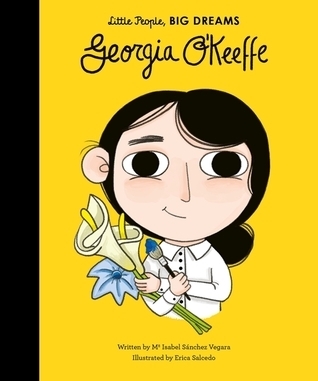 Georgia O'Keefe, by Isabel Sanchez Vegara, is the twelfth volume in the Little People, Big Dreams series for younger readers, which celebrates the lives of important and interesting women from around the world. It would probably appeal most to children aged 5-7 years. The series also includes titles about Maya Angelou, Coco Chanel, Frida Kahlo, Rosa Parks and Jane Austen. Disclaimer: I was given a complimentary copy of this book by Quarto Publishing Books, via Netgalley, in exchange for an honest review. Jennifer - O'Keefe is one of my favourite artists. I agree that it is odd that there no examples of her work.